Looking to escape the buzz of the city for the weekend but don’t want to leave your dog to a pet sitter? 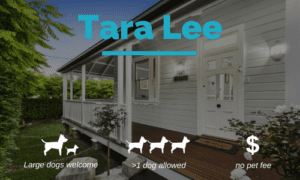 How about a dog friendly Hunter Valley? Yes, that’s right. 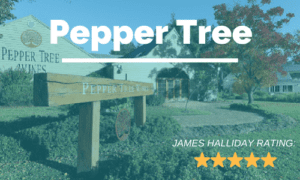 There are plenty of great dog friendly accommodations to choose from, dog friendly wineries to explore and dog friendly cafes / restaurants to eat out. 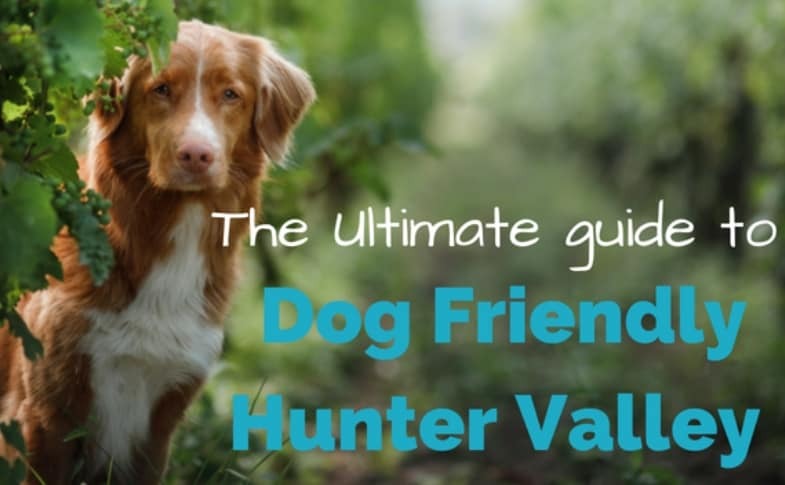 We have put together the ultimate guide to a dog friendly Hunter Valley to inspire your next visit to this stunningly beautiful wine region, located just 2.5 hours away from Sydney. As dog owners ourselves, we know finding a dog friendly accommodation can be a daunting task. We have personally talked to the management of each accommodation listed on Pupsy and therefore can guarantee your pooch is always warmly welcomed in each one of them. 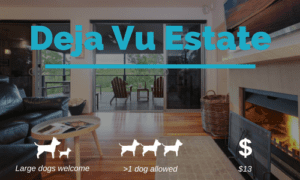 We have handpicked the best dog friendly places to stay in the Hunter Valley representing various types of accommodations from private homes to winery stays and hotels. Déjà vu Estate is a well equipped self contained villa in the heart of the Hunter Valley. Amenities include e.g. King Size bed, gourmet kitchen, fire place, free WiFi and a heated outdoor spa. 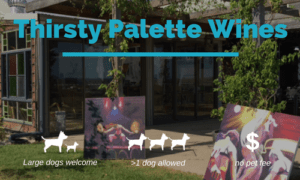 Thirsty Palette Wines is a tiny boutique winery / art house that also offers dog friendly accommodation. Premises have a fenced garden to give your pup some safe surroundings to sniff around. You can also book an art retreat guided by the resident artist. 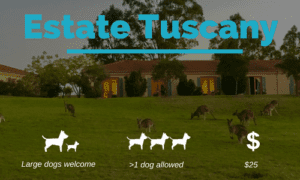 Estate Tuscany is a dog friendly estate with pool, restaurant, and a cellar door. Five rooms out of 38 are dog friendly. Estate Tuscany also offers pet sitting in case you would like to have a more finer dining experience in the valley. Dog friendly dining options are also available at the premises. 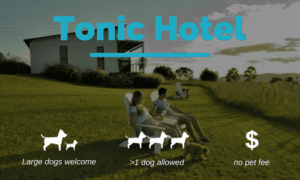 Tonic Hotel is located north from Lovedale and has a shared pool and lounge facilities. All the rooms are air-conditioned and come with free WiFi. Dogs of all kinds are welcome to the hotel with no extra fees. 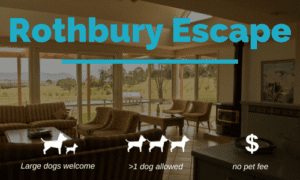 Rothbury Escape is set on 20 acres of beautiful gardens. It offers free continental breakfast and a guest lounge with a fireplace. Upon arrival, guests receive a free bottle of wine, as well as cheese and crackers. The property also offers a barbecue area and a shared kitchen. Misty Glen Wines is a cellar door also offering dog friendly stays. Their furry residents, Chardonnay & Semillon, are somewhat celebrities having featured in the Wine Dogs Australia. At times owners Eric & Vicci might be able to offer you pet sitting services in case you are visiting some non-dog friendly venues in the valley. 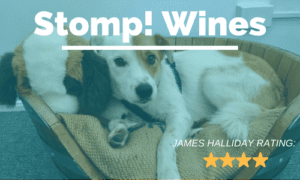 So now that we have the dog friendly accommodation sorted, it’s time to look at the cellar doors that welcome also our extended family to join for some delicious tasting sessions (two legs – wine tasting, four legs – H2O tasting). We have some great news to share! Nowadays, there are plenty to choose from. Based on rating high on dog friendliness, location, and wines, here’s our pick for the ones not to be missed. 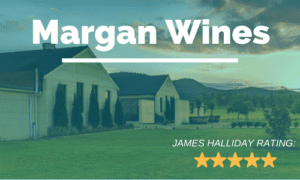 Margan Wines is located in Broke a bit further out from the centre of Hunter Valley action, which is not necessarily a bad thing. The winery features a dog friendly restaurant and is a very popular wedding venue. 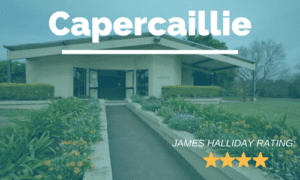 Capercaillie Wines is one of the most dog friendly wineries in the region located in the beginning of Lovedale Road. Responsible dog owners in good control of their dogs can even have their pups off the lead (ask the venue first). Hanging Tree Wines welcomes dogs to have a little play with their wine dogs Vodka & Muscat (golden labradors). 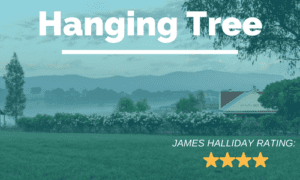 Build in an old cow shed, Hanging Tree has a very rustic feel to it. They focus is on Hunter classics: Shiraz, Chardonnay, Semillion and Cabernet Sauvignon. Stomp! Wines is a tiny family winery with a unique twist, crafting astonishing items (even dog beds) out of recycled wine barrels. You will be created by the owners and their wine dog Kimba on arrival. 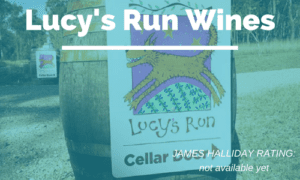 Lucy’s Run Wines is not ordinary dog friendly winery. They even have a dedicated range, Woof Woof Wines, for our furry friends. Pet Rescue receives 10% of all the profits from the Woof Woof range. Where can we eat without leaving our furriest family member tight into a tree or a post outside the venue? Yet again, Hunter Valley doesn’t disappoint. We talked and/or visited most of the venues in the area and can warmly recommend the following places to visit with your dog. They offer a great choice in particular for breakfast and lunch with your pup relaxing at your feet. 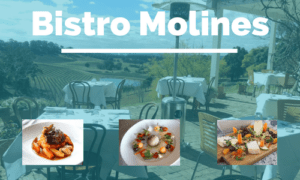 Bistro Molines is owned and run by the godfather of dining in Hunter Valley, Robert Molines. You can enjoy delicious french style lunch at the courtyard with your pup while taking in the fresh air and stunning views. 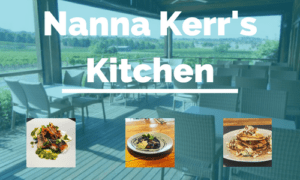 Nanna Kerr’s Kitchen is all about organics from food to beer and wine. Located south of Pokolbin this Kerr family run restaurant offers you a nice relaxing break from your wine tasting tour. 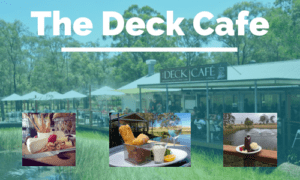 The Deck Café Lovedale is a lovely restaurant style dog friendly cafe. Verandah overlooking the dam provides protection from both the rain or the sun. Chill out with your pooch over brekkie or lunch. If your dog is a big swimmer, don’t forget to ask if he/she could have a quick dip into the dam. 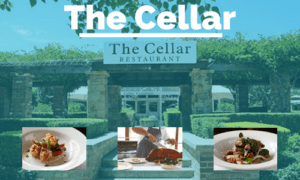 The Cellar is located a short stroll away from the Hunter Valley Gardens. Their Mediterranean inspired menu has something for everyone and your pup is welcome to join you on the outside seating area. 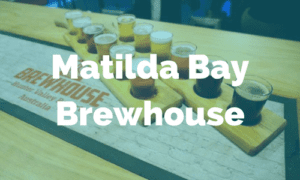 Matilda Bay Brewhouse offers all the beer lovers a break from the wine. An impressive list of local brews is available on tap and their Italian style menu has plenty to offer from snacks to proper mains. Dogs are welcome on the outdoor area protected from the sun by big sails. In our opinion, the best way to enjoy Hunter Valley in the evenings is to relax at your accommodation with some local deli platters (or BBQ) and of course some delicious Hunter wines with the entire family. If however, you want to pamper yourself with a culinary experience, a great option is to stay at the Estate Tuscany or Misty Glen Wines and make use of their in-house pet sitting service. Alternatively, you can find trusted pet sitters in the area through Mad Paws. That’s it, you are all set. Hopefully, we have inspired you enough to make your next visit to the iconic Hunter Region a tiny little bit furrier. This article was originally posted on the Pupsy website.